NEW DELHI, FEBRUARY 5: As many as 92,275 government schools in the country have only one teacher, depicting the sorry state of affairs in Government run schools. Madhya Pradesh has the highest number of such schools, nearly 20 per cent of the total. The data presented by the Union Ministry of Human Resource Development (MHRD) speaks volumes about the efforts being put in by the state government in implementing the Right to Education (RTE) Act, which was passed a decade earlier. Madhya Pradesh has over 18,000 schools with only one teacher, followed by Rajasthan and Uttar Pradesh with more than 12,000 and 8000, respectively. As per the Unified District Information System of Education (UDISE), 2016-17 report, there are 92,275 single-teacher Government schools at both elementary and secondary level. primary level, it is 35:1. while, as per the UDISE data, the PTR at the national level for primary schools is 23:1, for upper primary schools, is 17:1 and for Secondary level is 27:1. Nationally, there is a shortage of more than a million teachers in government schools, which translates to one in six teaching positions in government schools is vacant. There are some states which have filled most of the teaching posts, while in a number of others, half of the teaching posts are lying vacant for years. It is also seen that the states with lower literacy rates have larger shortages of teachers. Dr Satya Pal Singh, Minister of State, MHRD speaking in the Lower House (Lok Sabha) said that the recruitment, service conditions and redeployment of teachers are primarily in the domain of respective State Governments and Union Territories (UT) Administrations. In the northern region, Uttar Pradesh has the maximum number of schools running with only one teacher, which is over eight thousand. 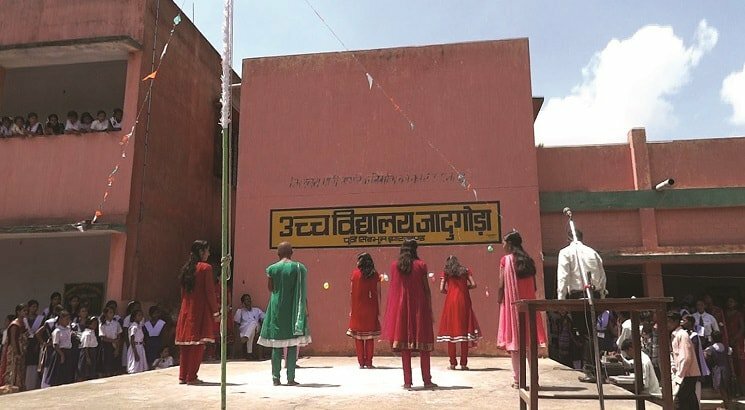 Almost half of all secondary school teacher posts in Uttar Pradesh are vacant, there have been attempts in past to fill up the vacant posts, but due to some or the other reason the process was either cancelled midway or scrapped due to allegations of widespread corruption in appointments. In the hilly states of the north, Uttarakhand (1858) and Jammu and Kashmir (1758) and Himachal Pradesh (1214) being run by just one teacher. Topography and extreme cold weather prove to be deterrent in people taking up teaching jobs in rural areas. In Plains, Punjab and Haryana both the states have done a significant amount of work in attracting and retaining people into teaching related jobs, therefore, the number of schools running on just one teacher is 879 in Haryana and 899 in Punjab. In the South, Tamil Nadu and Kerala in the past two decades have invested a lot in not only improving the quality of school infrastructure but also in teachers training. In Tamil Nadu, the net enrolment rate is at 99.85% and 99.11% at the primary and upper primary levels, it is also among the first states which have implemented RTE Regulations to a larger extent. The less number of schools being run by one teacher is 829, that in Kerala is just 294. In contrary to these two states, the situation in Andhra Pradesh (7483), Telangana(4587) and Karnataka (4767) need a lot improvement and the state governments can take a cue out of the policies put in place by the other two states of the region to improve the school education scenario. In the western states, Rajasthan has the highest number of elementary and secondary schools being run by only one teacher. 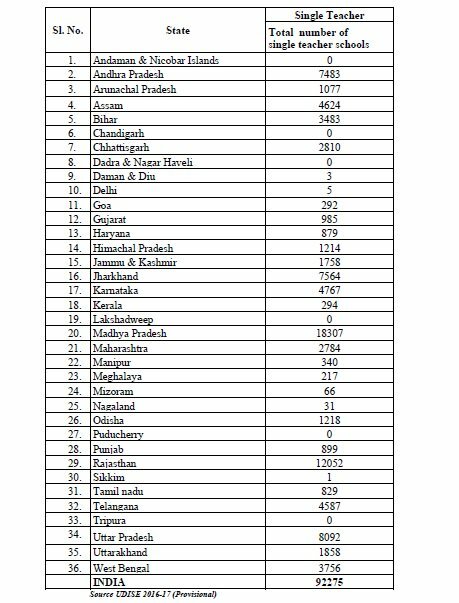 The state has 12,052 such schools, just trailing behind Madhya Pradesh. There are more than 2700 such schools in Maharashtra and 985 in Gujarat and 292 in Goa. The eastern states show a more homogenous trend. Jharkhand leads the eastern states with 7564 single teacher schools followed by West Bengal and Bihar with approximately 3500. Odisha fares slightly better at 1200. Another Government data reports that among the 36 states and union territories, Jharkhand has the worst secondary school teacher shortage at 70% (more than 38% at the elementary level). With Madhya Pradesh faring the worst at 18,307 schools, the neighbouring state Chhattisgarh though may look comparatively better with 2810 schools, features among the top 10 states. The North-Eastern part of the country is the second region after the south with a high literacy rate and a fair amount of attention being given to education. Except for Assam and Arunachal Pradesh, all the other states have less number of schools depended on only one teacher. In the state of Tripura, there is no such school while in Sikkim there is just one such school. Manipur and Meghalaya have 340 and 217 single-teacher schools respectively. Among the Union Territories, Daman and Diu and Delhi have three and five schools dependent on only one teacher, while others have no such situation. The big question to be answered is how successful has the Right to Education Act has been in providing education. What actual measures are being taken in this regard? Apart from the teaching support, what infrastructure support is being offered to the schools?